The Museo Alberto Ruz Lhuillier officially reopened in December of last year. A highlight is the recreation of the towering pier that once greeted visitors just inside the doorway of Temple XIX in Precolumbian times. 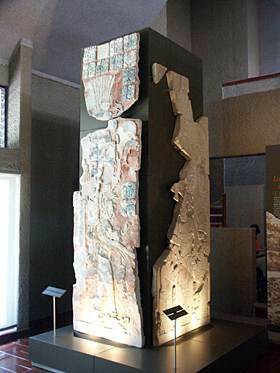 On one side is a polychrome stucco relief sculpture of Palenque's third-to-the-last known ruler, Upakal K'inich Janahb' Pakal II.